President Barack Obama presented UC Santa Cruz astronomer Sandra Faber with the National Medal of Science in a White House ceremony on Friday, February 1. Faber, a University Professor of astronomy and astrophysics at UCSC and the interim director of UC Observatories, was honored along with 11 other recipients of the National Medal of Science and 11 recipients of the National Medal of Technology and Innovation. These are the highest honors bestowed by the U.S. government upon scientists, engineers, and inventors. Chancellor George Blumenthal accompanied Faber to the ceremony. Faber was recognized "for leadership in numerous path-breaking studies of extra-galactic astronomy and galaxy formation, and for oversight of the construction of important instruments, including the Keck telescopes." In his remarks before presenting the awards, President Obama mentioned Faber's passion for astronomy and related an anecdote about a visit she made early in her career to one of the country's top observatories, where there was no dormitory for female astronomers and she ended up sleeping on a sofa in the caretaker's cottage. Faber is known for her pioneering research on the formation and evolution of galaxies, distant galaxy clusters, and the large-scale structure of the universe. She is also a leading authority on telescopes and astronomical instrumentation and has been closely involved with both the Hubble Space Telescope and the W. M. Keck Observatory in Hawaii. 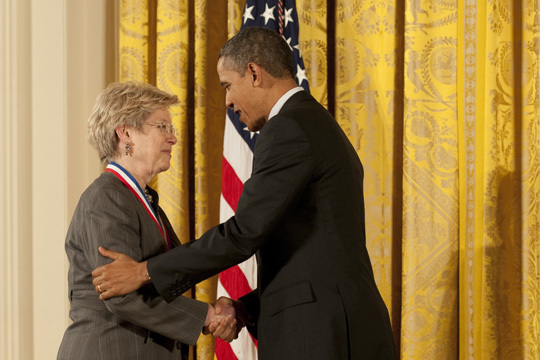 A member of the National Academy of Sciences, American Academy of Arts and Sciences, and American Philosophical Society, Faber has received many awards and honors for her achievements. These include the Franklin Institute's 2009 Bower Award and Prize for Achievement in Science and two awards for lifetime scientific achievement, the Bruce Medal of the Astronomical Society of the Pacific and the Russell Prize of the American Astronomical Society. The National Medal of Science was created by statute in 1959 and is administered for the White House by the National Science Foundation. Awarded annually, the medal recognizes individuals who have made outstanding contributions to science and engineering.